The lengthy Disney presentation at CinemaCon may still be going on, but it started off with the Marvel Studios presentation and President of Production Kevin Feige talking about the studio’s upcoming slate. For next year’s Iron Man 3, they showed a brief sizzle reel, which obviously didn’t have any new footage (because they only start shooting in three weeks), but it did have a few soundbites from writer/director Shane Black talking about the direction of the movie. 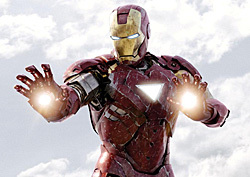 In the video presentation, Black dubbed the movie a “technological thriller” and a “crisis movie” set in the world of “international war, arms and terror” saying that they will “put Tony Stark through the wringer” as they explore the trials of being Tony Stark. Although no villain has been revealed for the film, he said the villain will be one that will “frighten in today’s world.” Any idea who he might be referring to? Unfortunately, we’ve fallen a bit behind on posting but look for a couple more posts about CinemaCon panels and footage shown very soon.